Old cartridges, what do I have? Thread: Old cartridges, what do I have? I got these from a box of reloading stuff I purchased years ago, and have no idea what they are. One is some kind of pin fire, bullet measures .452", case is .579" and oal is 1.039. Round nose bullet. 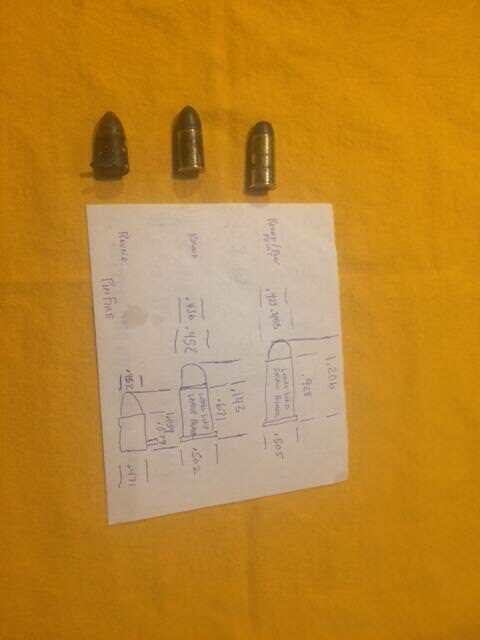 Next is a rimmed cartridge with a .423" bullet, case is .928" and oal of 1.206". Rim measures .505". Round nose flat point bullet. No markings or head stamps on anything. I'd post some pictures but I'm not smart enough to know how. All measurements taken with a digital caliper by a guy who may not be qualified to use one. Any Idea what I have? I would suggest figuring out how to post pictures of this stuff. It is very hard without seeing anything. We must have pictures to solve your riddle. Cartridges of the world gives cartridge dimensions in a table with all the critical measurements, so you can check your measurements by the table and help figure out which it might be easily. Pictures don't work with that link. 11) Save your post and you're done. Looks like it is side ways but I think it will work. This is what I do. I found a web site with a dimension chart about like the ones in " Cartridges of the World" thats easier to look at. I'll take a few measurements and start searching. When I think I have it id'd I'll look up the picture. Some of the metric cartridges can take a while to id. I love looking through those boxes of odd stuff that every reloaded seems to have! Lightman, would you like to share the link to that website, sounds pretty interesting. I'm not sure how to post a link but google WWW.Cartridge-Corner.com. The 3rd box down on the left is Headstamp/cartridge info and resources. Then you can scroll down through the different categories. Hope this helps, I really like using it. I just took some more measurements. I thought these were straight wall cases, they are not. 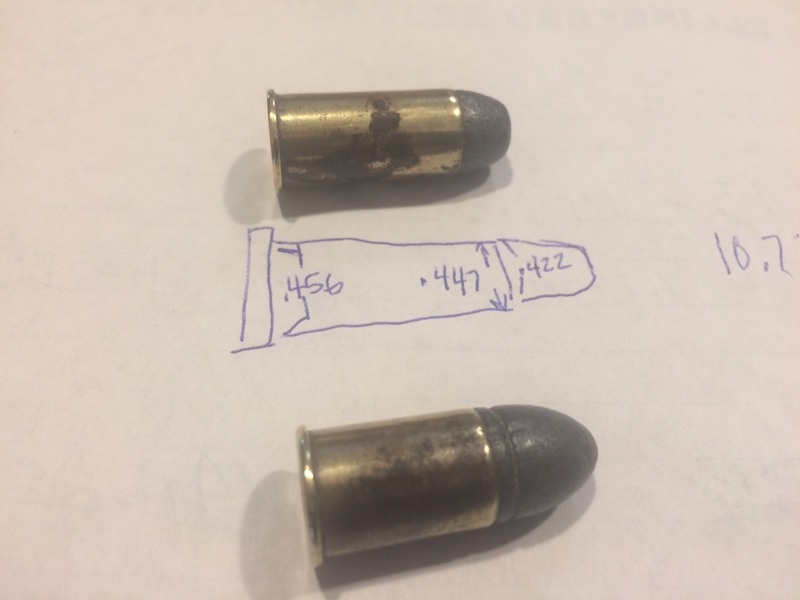 The longer of the two center fire cases measures .456" just ahead of the rim, and tapers to .447" just before the roll crimp at the bullet. The bullet measures .422" or 10.7mm. The shorter of the two is tapered also, and at the bullet is about the same diameter as the long case at that length. I just pulled the bullets from a few of the rounds. The longer cartridge has a 202 grain bullet with two lube groves, the shorter has a 200 grain bullet with 1 grove. The longer of the two has 18.2 grains of black powder. The shorter of the two I lost some of the powder as I pulled the bullet so I didn't weigh it. Looks like Boxer primers. The bullets measure about .422 diameter. (Kind of hard to tell with the dried lube and slight deforming) Any guesses? Italian Bodeo revolver cartridges? Or some Gasser round? GONRA sez - get an El Cheapo Harbor Freight Micrometer - measure DIAMETERS. Last edited by GONRA; 10-24-2018 at 06:35 PM. I've a had a set of good quality micrometer's (up to 4") for 30 years. I bought an el cheapo electronic caliper several years ago. The problem is not the tool, it's the dude running the tool.